Madison Riley has been one of the top competitors for the Wright State University Raiders, in the last few weeks. 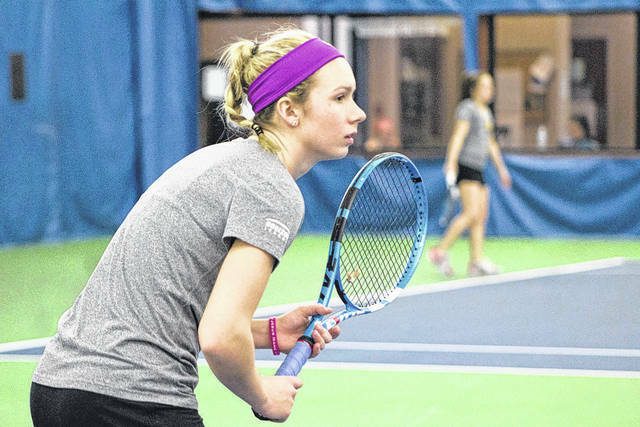 FAIRBORN — Wright State women’s tennis is nearing its win total from last season by posting a 14-9 record, with about a month still remaining in the regular season. Sophomore transfer Madison Riley has seemingly gone from unsung to one of the top competitors for the Raiders, in the last few weeks. As a freshman, Riley played for Western Carolina. She was often at the bottom of the lineup, but that didn’t stop her from setting a school record in singles wins with 16. Her choice to join WSU was motivated by its proximity to her hometown of South Point, near the Southern Ohio, Kentucky and West Virginia border. This season, Riley has usually been paired with Carroll High School grad Jillian Milano in doubles. The duo had a shaky start to the season, but a streak of recent victories has brought their record all the way up to 11-9. It has been a similar story for Riley in singles with a 16-17 record on her racket, but she is off to a hot start in conference play with a 3-0 record against Northern Kentucky, Horizon League powerhouse University of Illinois Chicago (UIC), and Indiana University Purdue University Indianapolis (IUPUI). Riley admits she can be a perfectionist at times on the court. During a match, she utilizes a few different strategies to sustain her belief in herself. “She’s working more on the mental side of the game right now and trying to get better in that facet,” Burns said. As a biological sciences major with hopes of reaching medical school, the student-athlete balance can be tough to juggle Riley says. The Raiders have been on the brink of bringing home the first Horizon League title for WSU after dropping the championship match two consecutive seasons to Youngstown State. With the recent rally from Riley, that could change soon.